The 6G Articulating Keyboard Arm Mechanism from Humanscale is a lightweight (only 6.5 lbs) articulating keyboard mechanism which uses 28% less material than previous models of Humanscale arms. 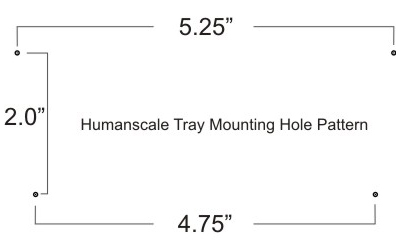 It provides height adjustability from 5.25" below to 1.75" above the mounting point. The 0° to 15° dial-a-tilt feature allows the user to set the tray at any desired negative inclination in that range. It includes a 22" steel track with plastic glides (not ball-bearings) for storage when the tray is not in use. 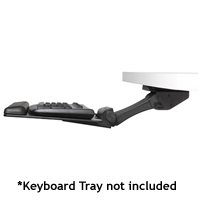 Note: The 6G Keyboard Arm Mechanism can only accept Humanscale keyboard trays. If you are unsure of what type of keyboard tray you already have or are willing to consider alternative ball-bearing arms with longer durability and superior range consider the Ovation Low Profile Leverless Arm. The Diagonal Big Board Keyboard Tray from Humanscale is designed to be used at a corner workstation. The angled edges at the rear enable the tray to fully clear the edges of the desk when the tray is extended. At 27.5" wide and 11.5" deep, the Diagonal Big Board Tray provides plenty of space for both the keyboard and the mouse. 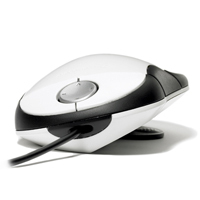 Its symetrical design allows the mouse to be used comfortably on both the left and right sides. The tray is composed of phenolic, an ultra-strong, remarkably thin (0.25") composite that is non-toxic, durable and easy to clean. Note: The Diagonal Big Board Keyboard Tray is compatible with the Ovation Low Profile Leverless Arm from Fox Bay Industries. 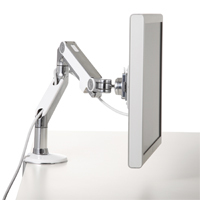 The M8 Monitor Arm from Humanscale accommodates a wide range of monitors available today - any monitor up to 42 pounds. It is the ideal solution for heavy monitor applications or any other environment with a flat panel monitor. The Switch Mouse integrates two major innovations - a V-shaped base, which puts the wrist and forearm into a slightly more natural pronation for left or right-handed users, and the Extender feature which allow the mouse to 'stretch' to provide some adjustment to the length (but not the width) of the mouse. 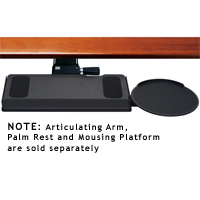 Other features include a built-in palm support to prevent contact stress on the wrist, four-way scrolling dish, and programmable buttons (requires installation of PC drivers) for user-specified functions. This mouse has a 1600 DPI laser sensor and comes only in a corded model (cord is 2 m in length). The QuickStand Eco from Humanscale is an easy-to-setup retrofit desk that takes up minimal space on a desk yet has enough workspace to accommodate a keyboard and mouse and a single monitor (28" x 19"). It is freestanding (no clamping or drilling required) and has ample height-adjustability for both worksurface and monitor with an impressive maximum range of 18.6". The monitor can be adjusted independently of the worksurface within a 5.5" range. The total weight capacity of the QuickStand Eco is 35 lbs (including 30 lbs for the monitor). Models are available in black or white colour. A dual monitor version is available, as well as a laptop version. 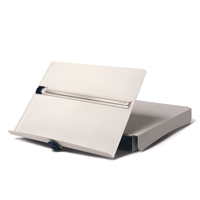 The Copy Holder from Humanscale is a storable in-line document holder. 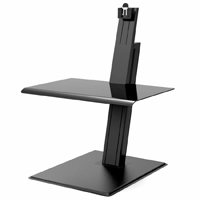 The sturdy powder coated steel base provides storage for the copy holder as well as acting as a 1.75" monitor riser. At 10 lbs it is easily able to provide support for bulky documents or even smaller books. The copy holder itself is angle adjustable, can be lowered up to 3.5" below the work surface, and can be extended forward up to 9" from the storage base. Glide tracks enable easy storage of the document holder and the attached magnifying line guide while a simple latch release permits the document plate to be lowered. The FM500 provides perfect support for the feet and legs to ease pressures on the lower back when sitting. With curved supports to encourage constant healthy rocking, the FM500 offers a surprising amount of functionality in a simple and elegant package. This rest features die-cast aluminum legs, a molded plywood platform, steel foot stop, and rubber grips (the dots on the top surface). The Foot Machine 300 from Humanscale uses ball bearing rollers to gently rock your feet like a rocking chair, encouraging continual movement and increased blood circulation to the muscles in and around the feet. The FM300B model adds massage balls to help relax the feet even more. All models give up to 3 inches of height adjustment for individual preferences. 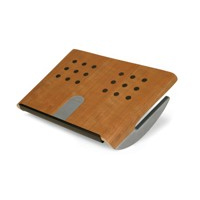 This rest features a steel frame, phenolic side supports, sold hardwood platform, plastic knobs, and rubber pads to prevent the feet from sliding off. 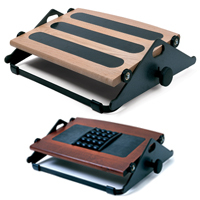 The Humanscale 900 Standard Keyboard Tray is a strong, thin phenolic tray that is durable and easy to clean. 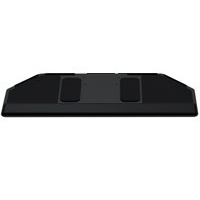 This 19.0" wide by 10.6" deep tray accommodates most conventional keyboards, has optional removable palm supports in foam or gel (sold separately), and can also accommodate an optional mousing surface for those who require extra space. Note: This tray is compatible with the Ovation Low Profile Leverless Arm. The Copy Stand Basic from Humanscale is a freestanding document holder that you can use in-line with your monitor and keyboard to avoid having to twist your neck while reading documents. 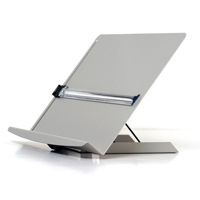 Made of powder-coated steel, the Copy Stand Basic is sturdy, durable, and easy to adjust.